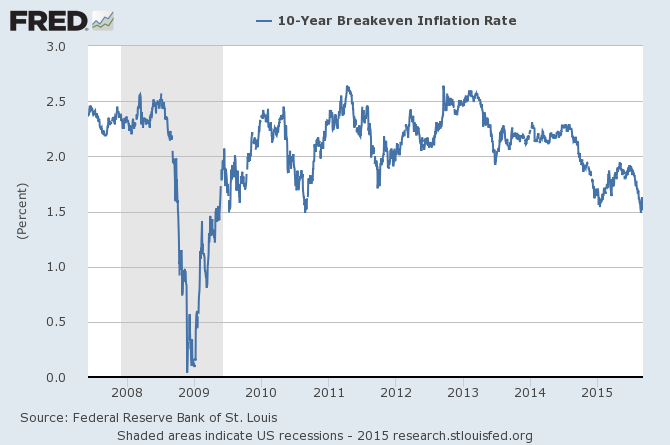 What are the bond markets telling us about inflation, recession and the path of central bank policy? For several years some commentators have been concerned that the Federal Reserve is behind the curve and needs to tighten interest rates before inflation returns. To date, inflation – by which I refer narrowly to CPI – has remained subdued. The recent recovery in the US economy and improvement in the condition of the labour market has seen expectations of rate increases grow and bond market yields have risen in response. In this letter I want to examine whether the rise in yields is in expectation of a Fed rate increase, fears about the return of inflation or the potential onset of a recession for which the Federal Reserve and its acolytes around the globe are ill-equipped to manage. Below is a table showing the change in yields since the beginning of February. 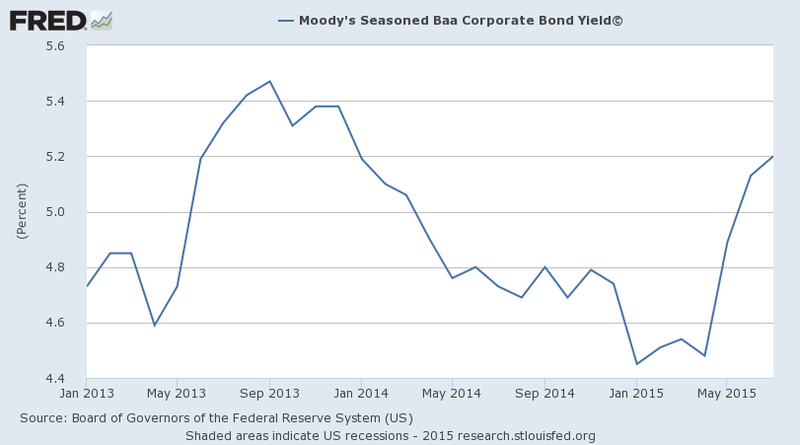 Moody Baa rating is the lowest investment grade bond. Whilst the widening of spreads is consistent with the general increase in T-Bond yields, the yield on Baa bonds has risen by 30bp more than Moody BB – High Yield, sub-investment grade. 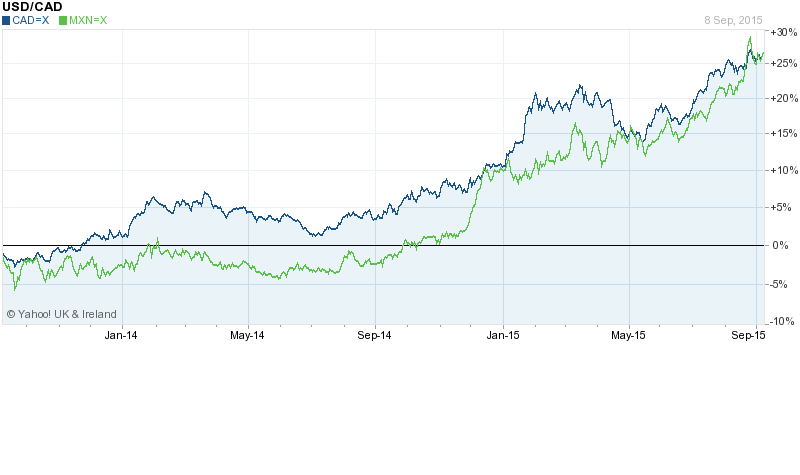 This could be the beginning of an institutional reallocation of risk away from the corporate sector. The increase in the cost of financing for the corporate sector is slight but the trend, especially since May, is clear. The risks to the forecast for real GDP and inflation were seen as tilted to the downside, reflecting the staff’s assessment that neither monetary nor fiscal policy was well positioned to help the economy withstand substantial adverse shocks. This is hardly hiking rhetoric. … Should the U.S. economy continue to recover and the Mexican peso weaken, growth in Mexico’s overseas sales is likely to continue improving in the coming months. With an election due on 19th October, the Canadian election campaign is focused on the weakness of the domestic economy and measures to stimulate growth. While energy prices struggle to rise, non-energy exports are likely to be a policy priority. After rate cuts in January and July, the Bank of Canada left rates unchanged this week, but with an election looming this is hardly a surprise. With its usual efficiency, China’s National Bureau of Statistics released its 2015 Q2 growth estimate earlier this week. Reportedly, GDP rose by 7.0% in the four quarters to Q2. We remain sceptical about the accuracy of China’s GDP data, and the speed with which they are compiled. 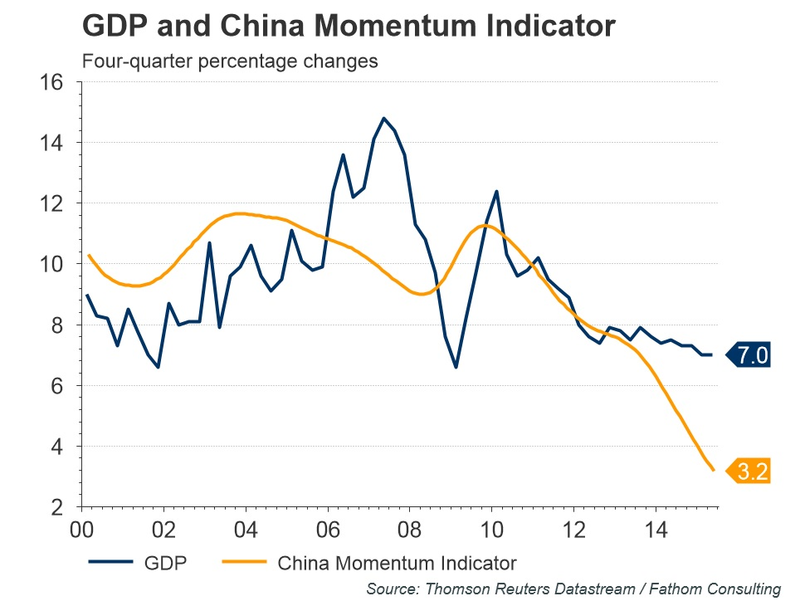 Our own measure of economic activity — the China Momentum Indicator — suggests the current pace of growth is nearer 3.0%. …although policymakers are reluctant to admit that China has slowed dramatically, the recent onslaught of measures aimed at stimulating the economy surely hints at their discomfort. While these measures may temporarily alleviate the downward pressure, they do very little to resolve China’s long standing problems of excess capacity, non-performing loans and perennially weak household consumption. Accordingly, as China tries out the full range of its policy levers, we believe that eventually it will resort to exchange rate depreciation. Its recent heavy-handed intervention in the domestic stock market has demonstrated afresh its disregard for financial reform. Canada and Mexico have both witnessed rising yields as their currencies declined, whilst Germany (a surrogate for the EU) and Japan have seen a marginal fall in shorter maturities but an increase for maturities of 10 years or more. China, with a still slowing economy and aided by PBoC policy, has lower yields across all maturities. Mexican inflation – the highest of these trading partners – was last recorded at 2.59% whilst core inflation was 2.31%. The 2yr/10yr curve for both Mexico and Canada, at just over 100bps, is flatter than the US at 145bp. The Chinese curve is flatter still. The future of medical diagnosis is about to experience a radical shift. The same pocket sized computer which now holds the power to beat any human being at the game of chess, will soon be used to diagnose medical ailments and prescribe actions to follow, far more cheaply and with a whole lot more accuracy. The bond yield curves of America’s main import partners have steepened in train with the US – Canada being an exception – whilst stock markets are unchanged or lower over the same period – February to September. Corporate bond spreads have widened, especially the bottom of the investment grade category. Corporate earnings have exceeded expectations, as they so often do – see this paper by Jim Liew et al of John Hopkins for more on this topic – but by a negligible margin. The FOMC has already expressed concern about the momentum of GDP growth, commodity prices remain under pressure, China has unpegged and the US$ TWI has reached new highs. This suggests to me, that inflation is not a risk, disinflationary forces are growing – especially driven by the commodity sector. Major central banks are unlikely to tighten but corporate bond yields may rise further. Remain long US$ especially against resource based currencies, but be careful of current account surplus countries which may see flight to quality flows in the event of “risk off” panic. At the risk of stating what any “value” investor should always look for, seek out firms with strong cash-flow, low leverage, earnings growth and comfortable dividend cover. In addition, in the current environment, avoid commodity sensitive stocks, especially in oil, coal, iron and steel. 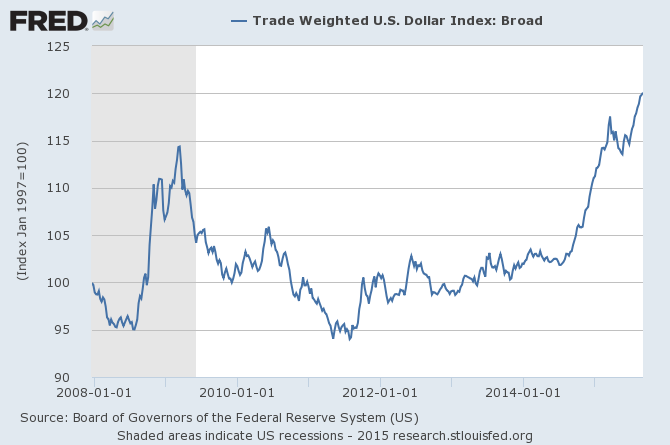 US T-Bonds will benefit from a strengthening US$, if the FOMC delay tightening this will favour shorter maturities. An early FOMC tightening, after initial weakness, will be a catalyst for capital repatriation – US T-Bonds will fare better in this scenario too. Bunds and JGBs are likely to witness similar reactions but, longer term, both their currencies and yields are less attractive.